NASA’s New Horizons spacecraft is now almost seven years into its 9½-year journey across the solar system to explore Pluto and its system of moons. 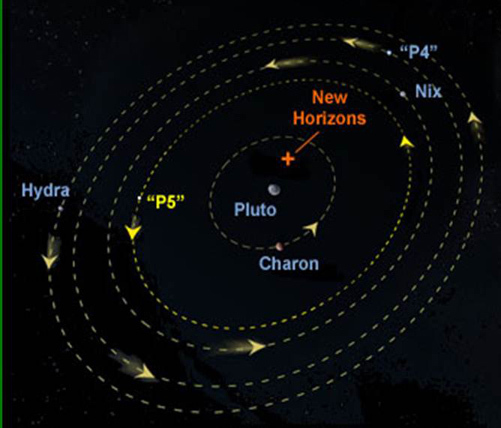 Just over two years from now, in January 2015, New Horizons will begin encounter operations, which will culminate in a close approach to Pluto on July 14, 2015, and the first-ever exploration of a planet in the Kuiper Belt. As New Horizons has traveled through space, its science team has become increasingly aware of the possibility that dangerous debris may be orbiting in the Pluto system, putting the spacecraft and its exploration objectives into harm’s way. The New Horizons team is already using every available tool — from sophisticated computer simulations of the stability of debris orbiting Pluto, to giant ground-based telescopes, to stellar occultation probes of the Pluto system, to the Hubble Space Telescope — to search for debris in orbit. At the same time, the team is plotting alternative, more distant courses through the Pluto system that would preserve most of the science mission but avert deadly collisions if the current flyby plan is found to be too hazardous. “We’re worried that Pluto and its system of moons, the object of our scientific affection, may actually be a bit of a black widow,” says Stern, who discusses this aspect of the flyby today at the annual meeting of the American Astronomical Society's Division for Planetary Sciences in Reno, Nevada. New Horizons is the first mission in NASA’s New Frontiers program. APL, located in Laurel, Md., built and operates the New Horizons spacecraft and manages the mission for NASA’s Science Mission Directorate. SwRI led the payload/instrument development and leads the New Horizons science and mission teams from the Tombaugh Science Operations Center, located at SwRI facilities in Boulder, Colo. For more information, go to: http://pluto.jhuapl.edu/. Field of Debris? The discovery of additional small moons has raised concerns about the possibility of rings or other debris structures in the Pluto system that can pose hazards to New Horizons. Even a millimeter-sized pebble’s impact at New Horizons’ flyby speed – about 14 kilometers per second, or more than 31,300 miles per hour – could seriously damage the spacecraft.